Actually, I didn’t make the claim that Ruby follows the principle of least surprise. Someone felt the design of Ruby follows that philosophy, so they started saying that. I didn’t bring that up, actually. From the viewpoint of what you can do, therefore, languages do differ – but the differences are limited. For example, Python and Ruby provide almost the same power to the programmer. I didn’t work hard to make Ruby perfect for everyone, because you feel differently from me. No language can be perfect for everyone. I tried to make Ruby perfect for me, but maybe it’s not perfect for you. The perfect language for Guido van Rossum is probably Python. People are different. People choose different criteria. But if there is a better way among many alternatives, I want to encourage that way by making it comfortable. So that’s what I’ve tried to do. 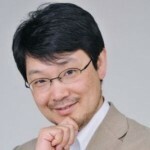 Yukihiro Matsumoto is a Japanese computer scientist and software programmer best known as the chief designer of the Ruby programming language and its reference implementation, Matz's Ruby Interpreter.